Each month on the 22nd Christina of Creating My Own Garden of the Hesperides invites us to join in on a consideration of foliage in the garden. Foliage effects in the winter months can seem to drag on and February may have its pleasant moments in Christina’s Italian landscape, but here in Pennsylvania February is the month when the relentless assault of winter begins to wear down even the toughest greenery. Imagine my surprise when a beautiful February weekend comes along and gets me thinking about outdoor things other than snow. It felt great to get outside again, do a few spring-like tasks, and consider what was holding the garden together. 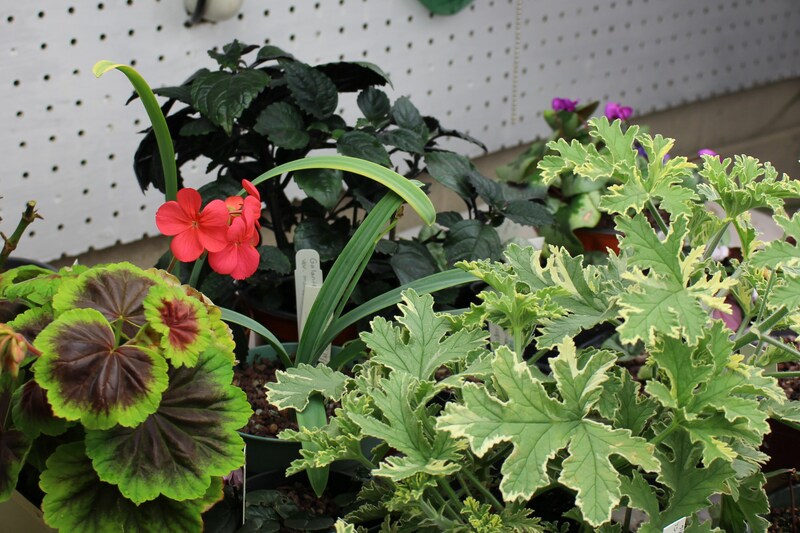 Even a nice February day needs some warmup time, so while waiting for the thermometer what better thing to do than enjoy the foliage of geraniums (Pelargonium) and other tender plants indoors under the growlights. One task I did tackle was a little front garden cleanup. The snowdrops are coming up here in the front foundation bed, and dead sunflower trunks do not add to ambiance of the scene. Blue fescue (Festuca glauca, cultivar unknown) does though, and I’m enjoying the edging of faded blue which lines the front. A nice solid swath of one plant helps tie this bed together but I’m not entirely convinced I can give up my collecting habits in favor of better (notice I won’t say good) design. My single mass planting of little fescues is a starting point though and even if I can’t add more solid pools elsewhere maybe I can at least repeat a few nice patches of similar foliage here and there for the sake of continuity. Cute tufts of Festuca glauca in their winter finery…. which looks remarkably like their spring summer and fall finery, but every garden needs a few reliable doers. Another grass which has lasted well throughout the winter are the native little bluestem clumps (Schizachyrium scoparium) which dot the back meadow area. 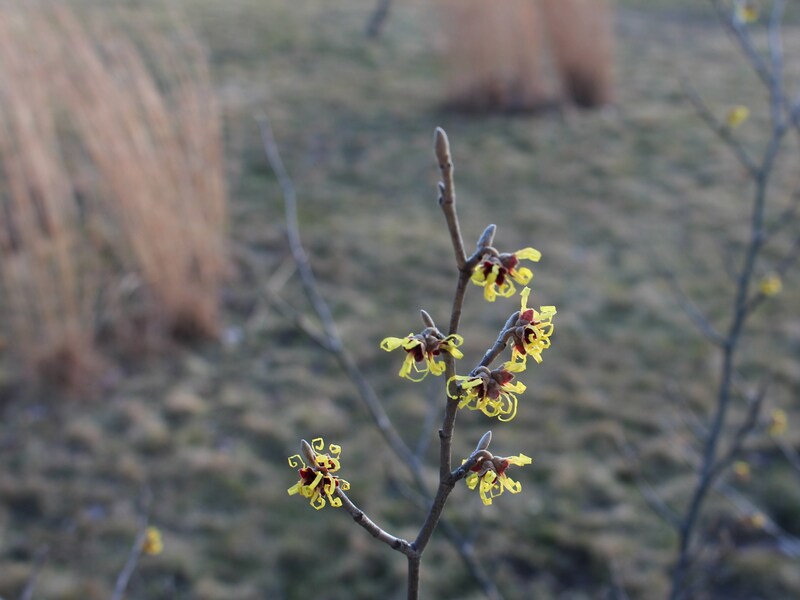 They will be cut down shortly as crocus blooms begin to fill the meadow, but for now they’re a nice backdrop to my weakly flowering witch hazel (Hamamelis mollis ‘Pallida’). It’s too dry and exposed here for the witch hazel to do well in this location, but it hangs on and every now and then has a good spring. The crinkled blooms of ‘Pallida’ Chinese witch hazel are always a nice winter surprise and I feel like the russet foliage of the little bluestem grass in the background complements the flower color well. It may have felt like spring for a few hours but it’s still surely winter around here. El Nino has thrown things for a loop and by my wildly inaccurate guess we are about three weeks ahead of a ‘normal’ winter. Not a problem I say, and I’ll take the early snowdrops and deal with future wild temperature fluctuations as they come. So even in the dead of winter there is foliage making a contribution and there is hope for the upcoming year. Hope is always a good thing, and what better way to breed more hope than to look at other inspiring foliage effects from around the world. Give Christina’s blog a visit and as always have a great week! This entry was posted in cyclamen, foliage, garden design, late winter, winter flowers and tagged flowers, garden, garden bloggers foliage day, winter flowers, winter garden. ← Cold? I barely noticed. Here’s to an early spring. Beautiful snowdrops. I do like my snowdrops 🙂 and the warm spell has me even more anxious for spring so the earlier the better! It was cold, but the snow has mostly missed us this year… some would say this is a good thing, the kids here would disagree. You would have to search the cold corners of the yard to find any snow leftovers, rain and a 60F Saturday melted nearly all of it! Nice to see your snowdrops and I like your indoor foliage. Indoor plants keep me going through Jan/Feb when the weather doesn’t encourage me to go outside! I hope your plants will be ok without their usual blanket of snow, like John, I thought you were under a layer of white. Today was a beautiful day and it looks as if most everything has made it through the last blast of cold. There is damage, but there is also so much promise for the new year! Your grow lights work so well, the plants are really healthy looking and definitely something to enjoy if you can’t get outside. So it was good to hear you had a nice weekend and could enjoy being outside. I think your Festuca looks great and you know you are right about a bit of continuity of planting to link different areas will make for a better design but still allow you to keep collecting and trying new things. Thanks for joining GBFD this month. GBFD is always an interesting post and it’s good to refocus on something different every now and then. If only I could keep up with the continuity of plantings in other areas as well I think it would really help the look of my garden… but it’s so much fun to try all those new plants! 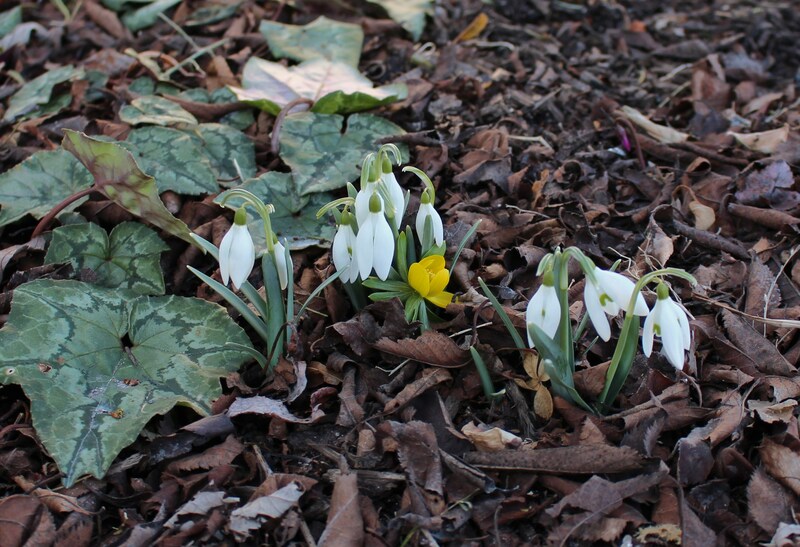 Looks like spring is definitely on its way in your garden. 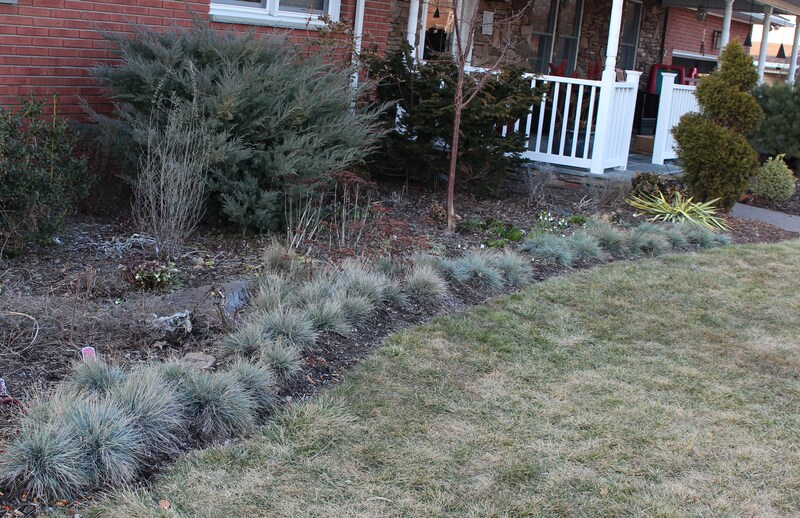 The Festuca is really attractive, it must make a nice edging plant when it grows out. I should clip it back for a fresh spring look, but it looks so full now compared to the newly transplanted look. Maybe I’ll wait until after the snowdrops finish. I hadn’t thought of it like that before – I have lots of dead leaves on my garden still, which also count as foliage don’t they?! Good to see some signs of spring are coming your way. Love your little witch hazel. Slowly but surely spring is arriving here as well, despite waking up to a sprinkling of snow again! I hope spring makes it to you as well. It’s been warm again today, which is unusual for this time of year, but I’ll take whatever I can get. It felt so nice being outside again and getting things ready for the new year! I just ordered a dwarf witch hazel, so yours is doing well if you think of it that way! haha, I didn’t even know there were dwarf witch hazels. I need to reinvestigate the group, I always thought the Chinese ones were showiest, but you showed a vernal witch hazel which was very nice, and I’m wondering if this is one of the American types…. I agree, spring weather for a “few hours” then the blast back to reality. Today was one of those eye opening days of nasty winter weather. All plants under the snow which looks great, but the wind!!!! …and again a short break from the cold and then another dip early next week. Still I think they’re not as serious as those earlier winter blasts and I’m hoping we’ve turned the tide!